Hello all, I just wanted to share with you a story that warmed my heart so much this week. Sweet Melissa, over at Stafford Stories, just announced her pregnancy after dealing with a two year journey with infertility. After several failed IUI's and a failed IVF with ICSI, she and her husband were able to conceive on their own after their doctor gave them only a 5% success rate. It truly is a miracle from God. I will never take for granted what God has given to us and truly believe every baby is a gift from God. I hope this story gives all women praying for a baby hope. Wow, that is amazing!! Congrats to them!! That's we just started...IVF with ICSI Cycle #1. I hope it works:) Can't believe how far along you are, Karen! I'm so excited for you...how are you feeling? 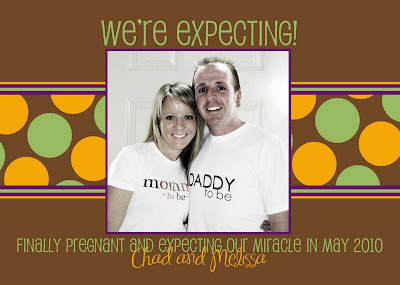 I read Melissa's blog from time to time and was so excited for them! Babies are such a miracle and their story is the reason why! This body of water near Brent Cemetery is said to turn red in late spring. Some people say they have seen a mysterious woman near a sacrificial table by the water. Thanks for the sweet post Karen! I look forward to the arrival of Jillian. All the best! You are too sweet! Such an awesome story they have, I am very happy for them! Stories like this are so amazing to me! Congrats to them!! These stories are so awesome to hear! Congrats to them. Thanks so much for sharing!